This group is unique - there is no other trio of piano, balaphon and drums. This might be one reason why the music is exceptional and why it can escape many of the clichées of world music and Jazz. Another one is the mixture of three extremely different individuals who share a profound joy of playing and communicating music amongst themselves and with their audience, producing an enormous and inexhaustible positive energy. Hans Lüdemann is pianist, composer and head of the TRIO IVOIRE. He is considered to be „one of the most original and expressive European pianists“ (Jazz Podium) or simply „one of the great pianists of contemporary Jazz“ (Hessischer Rundfunk) and is receiving the „ECHO Jazz“ award in 2013. In the TRIO IVOIRE his „distinct voice of his own“ (Frankfurter Allgemeine Zeitung) on the piano connects to Aly Keita, the „magician of the balaphon“ from Ivory Coast/Mali, whose breathtaking virtuosity and energy is hard to match. He and Lüdemann are „soul mates“ who have found each other across cultural boundaries. Drummer Christian Thomé connects the musical worlds with his unique sound on the drums. With his highly individual style, he gives great clarity even to the most complex rhythmic structures and color to simple grooves. The sparsely used electronic colors of Hans Lüdemanns „virtual piano“ expand or contrast the acoustic instruments. The TRIO IVOIRE is melting personal roots of African, European and Jazz traditions and uniting African balafon with piano, drums and electronics to create a contemporary sound that is without comparison. This has little to do with traditional African music, but a lot with finding artistic expression in a globalized reality. On the search of transporting traditional African instruments into the modern world on one hand, looking for new ways of expression in piano and Jazz music on the other, two worlds are approaching each other that seem far apart. The result is a personal expression of our time. Altogether the three musicians create their own music beyond clichées - a joyful play of three exceptional personalities between traditions, visions and experiments. Especially when African polyrhythm and European polyphony unite or when the different backgrounds are emphasized is where the creative energies of the group emerge. The musical magic of TRIO IVOIRE connects Jazz back to Africa, finding a subtle balance between rich and complex rhythmic and musical structures and an emotional depth that can be touching - playing straight into the heart of the listener. Currently, the TRIO IVOIRE is working on its new fourth CD release entitled „Timbuktu“, scheduled for release in January of 2014. It is a hommage to the country of Mali in the heart of West Africa. With a poetic, bluesy impression the trio evokes the spirit of Timbuktu, legendary city in the desert. This is where a musical journey begins that takes us on winding paths into inner and outer landscapes - from the „heartbeats“ to the dancing „Maloya“, from the intricate composed structures of „Crum“ to the joyful „Makuku“ and to a piece of Mbira music from Zimbabwe dedicated to the memory of Chiwoniso, the singer who used to work with the TRIO IVOIRE in recent years. IVOIRE - IVORY, is a precious material. A special use is for the keys of high quality pianos, lending to the player a uniquely warm and sensual touch. COTE D‘IVOIRE - IVORY COAST is the country where Aly Keita was born, where he and Hans Lüdemann met and had their first big success with TRIO IVOIRE. These different connotations can be found in the group name as well as the mirroing of the letters (T) r i o (I v) o i r (e) - symbolic of the way, the trio plays with the tones. Also „river“, „to see“ and „riot“ could be found..... French is the common language of the group. Hans Lüdemann has been in touch with Africa for a long time. His improvisations and compositions are inspired by African music. 1999 on his solo tour through West Africa, he met Aly Keita in a project of the Goethe institute Abidjan. The premiere was a big success. Further invitations to Abidjan followed, and the Trio Ivoire was founded.The first meeting was in Germany to record a radio production for the WDR, which came to be the first CD. As a drummer they chose one of the most individual European musicians, Paris-based British drummer Steve Argüelles. In 2000 the TRIO IVOIRE had its first concert in Africa with immediate success. The show in Abidjan was recorded and broadcasted on television. Since then they have been on many concert tours and festival, radio and tv appearances in Europe and Africa. Highlights have been the EXPO 2000, the Music Meeting Nijmegen 2002, Leverkusener Jazztage 2004, Münchener Klaviersommer 2005, in the cultural festival program of the soccer worldcup in Germany in 2006, featuring singer Dobet Gnahoré from Ivory Coast. Also, the trio has appeared on different „official“ occasions such as the „Afrika-Forum“ of the German President in 2005. Dutch drummer Chander Sardjoe played with the TRIO IVOIRE for the first time in 2002 and became the new drummer of the group from 2007 - 2012. The 2007 tour of West and South Africa was received with soldout concerts and standing ovations, showing the renewed energies of the TRIO IVOIRE. The TRIO IVOIRE also performed at the „Bachfest Leipzig“ and the „Nancy Jazz Pulsation“ and went on another African Tour in 2008, performing also at the HIFA-Festival Harare and doing a special project with singer/Mbira player Chiwoniso. In 2009 - 2011, the TRIO IVOIRE has celebrated 10 years with the new CD release on ENJA records and concert tours in Europe, Africa and the USA. Highlights included appearances at the Jazz Festivals Basel and Ouagadougou and special jubilee events in Bielefeld/ Oetkerhalle, Berlin/Haus der Kulturen der Welt and Aachen/Jazz across the borders festival. Special guest on these concerts and the new CD was Chiwoniso. 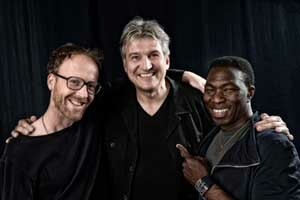 In 2012, Hans Lüdemann & TRIO IVOIRE realized a project with the NDR Bigband in Hamburg. In January of 2013, the group had its premiere with new drummer Christian Thomé in Vienna at the Porgy & Bess. Other projects of H. L.
A discography and biography, reviews etc. to download.